(AINA) -- On August 7 Assyrians worldwide celebrated the 80th anniversary of the Simmele massacre, including in Ankawa, within the Kurdish autonomous region in north Iraq. President Massoud Barzani of the Kurdistan Regional Government (KRG) sent a letter of support to the Assyrians, but in his letter he indirectly made the Assyrians victims of the Simmele massacre martyrs in the "Kurdistan liberation movement." Kurdish leaders, starting with Barzani, have asked the West to recognize Saddam's killing of Kurds in the Anfal campaign as a genocide. But the Kurds themselves have much blood on their hands because many Kurdish clans actively participated in the murder of Assyrians during the Turkish genocide in World War One, as well as other massacres perpetrated before and after 1915. Some Kurds have apologized for these acts (AINA 4-23-1995). Most recently, the Kurdish Federation in Germany issued an apology at the unveiling of the Assyrian genocide monument in in Belgium (AINA 8-5-2013). Assyrian organizations have asked for official recognition of the Simmele massacre (AINA 8-8-2013) and an apology by KRG President Barzani, who represents the Kurdish nation in Iraq. In relation to Chaldean-Syriac-Assyrian Martyrs day I offer warmest greetings to the spirits of those martyrs and all the martyrs of the Kurdistan Liberation Movement, expressing my heartfelt consolation to the victims of that savage, dreadful massacre which the Iraqi regime carried out at that time. Verily that catastrophe is 7/8/1933, in the Simmele area that is not erased from memory and is evidence of the fact that all the constituents of Kurdistan equally opposed the catastrophes, the lack of acknowledgement and the oppression. Truly the constituents of Kurdistan have measured out the long years of suffering and abrogation [of rights etc.] on account of chauvinism and despotism on the part of whoever holds power/authority in Iraq. But today it makes us happy that the Kurdistan region has established a center of peace, stability and co-existence for all its ethnic and religious components, and our homeland has become a shelter of security for all who come here fleeing from killing and terrorism. What does Barzani mean when he says "martyrs of the Kurdish liberation movement?" The Assyrian martyrs in Simmele were not part of the Kurdish liberation. They were massacred not because they were Kurds, but because they were Assyrians. By making such a statement Barzani is pursuing a campaign to Kurdify the Assyrian question. The attentive reader may ask why Barzani is using Assyrian denominational names (Chaldean, Syriac) when referring to the Assyrian nation. The answer is that this is Barzani's attempt to categorize Assyrians as Christian Kurds or just Christian citizens of the KRG. For years we have seen a clear pattern among Kurdish leaders and intellectuals of an aggressive Kurdification campaign in order to create a false Kurdish history. They make it easy for themselves by simply replacing the word "Mesopotamia" with "Kurdistan" and thus claiming that "Kurdistan is the cradle of civilization." 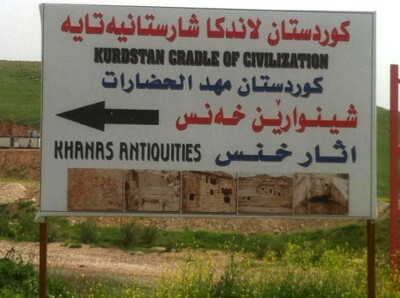 We find this message on a sign on the road to the Assyrian antiquities in Khanas, constructed by the Assyrian King Sennachereb in the 7th century BC. Kurdish intellectuals also write articles with the same message. A few months ago a Kurdish student in Uppsala, Sweden, Necati Kanat, wrote a propaganda article of this sort on Newsmill, where he said, among other things, "...civilization arose in Mesopotamia (Kurdistan). Mathematics, arithmetic, penmanship, irrigation systems, the wheel et cetera, were originated as part of the development of civilization. It started with small villages along the Euphrates and Tigris rivers in Kurdistan and moved to cities, cultures, kingdoms and empires." In 1843 and 1846 Kurdish clan leaders Bedr Khan Beg and Nurullah murdered tens of thousands Assyrians in Hakkari and Turabdin. They were the henchmen of the Turkish sultan. Bedr Khan Beg's cousin's sons, Izaddin Sher and Masur Beg, continued the killings of Assyrians in Tur Abdin in 1855. Sultan Abdulhamid's Hamidiye troops, who killed some 20,000 Assyrians and Armenians 1894-96 in the towns of Omid, Urhoy, were also Kurds. 20 years later, in 1915, various Kurdish clans actively engaged in the genocide of World War One, and many tribal leaders also became wealthy landowners after taking Assyrian lands by force. They also took captured Assyrian women and girls as wives. One of the leaders of the Assyrian liberation struggle in World War I, Patriarch Mar Shimon Benyamen, was murdered by the Kurdish leader Simko in March 1918. The murder took place in a treacherous ambush just as the Patriarch and his entourage had mounted their horses to leave after concluding peace negotiations with the Kurdish warlord Simko, in his own home. But Simko had put snipers on the roof. The murder was a disaster for the Assyrian liberation struggle. 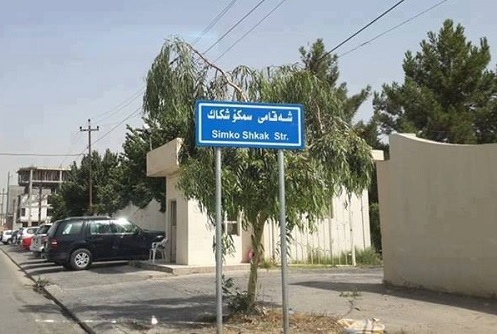 Today the KRG has a street called Simko. Apparently he is considered a hero in Kurdish eyes. The general who led the Iraqi forces in the Simmele massacre of 1933 was a Kurd named Bakr Sidki. He had previously been an officer in the Turkish-Ottoman army and participated in all probability also in the genocide of 1915. Barzani knows all this very well, but it bothers him little and an official apology seems not to be on his radar. But the truth can not be concealed, even if in the short term it can be distorted. Kurdish leaders and intellectuals need not resort to such drastic measures as falsification of history to form their own country or their own autonomies. Their numbers and their support from the West are sufficient. If we Assyrians end up being forced to live as citizens of a possible Kurdish state, then let us be proud of our identity and live in peace with our neighbours. All people want to live in peace and harmony. 1 Barzani's letter was translated for AINA by Aymenn Jawad Al-Tamimi.